Pest Expert Formula ‘P’ Cluster Fly Powder is a highly effective cluster fly killer offering long-lasting cluster fly control. It is a powerful contact dust perfect for application to areas where a spray based residual insecticide is not appropriate such as around power cables, sockets or electrical wiring. The powder can also be used around potential entry points to prevent re-infestation. Applying the power to cracks and gaps in brickwork on window frames ensures that cluster flies will be dying upon entry. Formula 'P' Cluster Fly Powder is an important part of any comprehensive cluster fly treatment. For best results the Formula 'P' Cluster Fly Powder should ideally be used with Pest Expert Formula 'P' Smoke Bombs or Formula ‘P’ Cluster Fly Foggers. Please also see our complete Cluster Fly Treatment Packs which contain Cluster Fly Spray, Smoke Bombs or Foggers and Cluster Fly Powder along with a Safety Mask and Gloves and comprehensive cluster fly treatment instructions. A carefully designed and selected bundle of the market's leading cluster fly products from Pest Expert. This kit includes Formula ‘P’ Cluster Fly Smoke Bombs, Formula ‘C’ Cluster Fly Spray and Formula ‘P’ Cluster Fly Powder giving you a potent combination of insecticides for both fast knockdown and long-term protection ensuring that your home or business remains free of cluster flies. Pest Expert Formula ‘P+’ Cluster Fly Fogger is a powerful fly killing fumigation aerosol (ULV) canister, designed for rapid and effective knockdown to cluster fly populations in lofts, roof spaces or rooms. Once activated the powerful insecticidal gas will kill all cluster flies present at time of treatment while leaving no residue on any furnishings or stored goods. 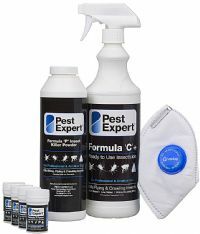 Pest Expert Formula ‘C’ Cluster Fly Spray is a highly effective cluster fly killer, the spray forms a long lasting residual which will maintain its rapid knockdown effect for up to 3 months. Formula ‘C’ is non-staining, solvent free and low odour making it perfect for use in homes with children and/or pets. Perfect for application to alighting surfaces, window frames and wooden beams. This 1ltr trigger spray will treat an area of up to 20 sq m.